Since I’ve already covered buckwheat cookies and almond flour cookies, I figured a coconut flour recipe was in order for those of you who need to remain grain-free and nut-free. Of course, working with coconut flour comes with its own set of challenges. What I love about coconut flour is that it’s more affordable than other grain-free flours; it’s so absorbent, a small amount goes a long way. However, it’s also a very tricky ingredient! Flax eggs won’t work as an egg substitute with this recipe (believe me, I’ve tried! ), and if you don’t measure the coconut flour correctly, it can affect the results dramatically. For the record, I like to scoop the measuring cup into the coconut flour, then swipe the top with a knife to level it off. Instead of being dense and chewy like a traditional chocolate chip cookie, this particular recipe yields a much lighter, almost cake-like cookie, similar to a chocolate chip muffin top. 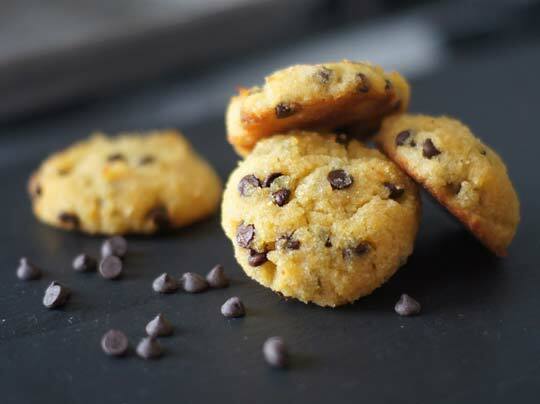 It’s simply impossible to create a chewy cookie with coconut flour, without resorting to adding a bunch of other fillers, like starches or nut/seed flours, and that sounds way too complicated to me. If I’m going to get almond flour involved, why not just make my almond flour cookies instead? Since I prefer to keep my recipes as simple as possible, I’ve decided to embrace the texture that coconut flour provides, and go with the cake-like consistency. My husband has proclaimed these cookies to be one of his favorites, anyway, so I hope those of you who enjoy softer cookies will love them, too! 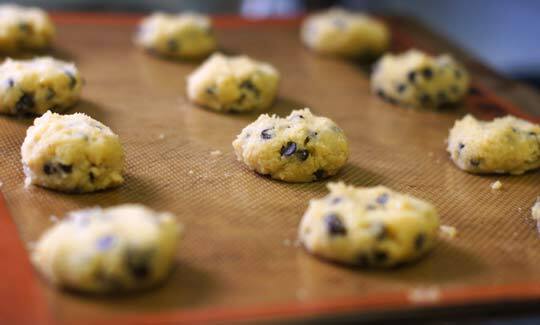 Use a heaping tablespoon to drop the cookie dough onto the lined baking sheet, and use your hands to flatten the cookies. Keep in mind these cookies will NOT spread on their own, so you’ll want to shape them how you’d like them to turn out. Bake at 350F for 12-14 minutes, until the edges are golden brown. Allow to cool on the pan for 10 minutes, then transfer to a wire rack to cool completely. *Note: These cookies can be stored on the counter for a few days, but I found that they get even softer after a few days at room temperature, so they are best stored in the fridge for the longest shelf life. A light and fluffy cookie, made with coconut flour. 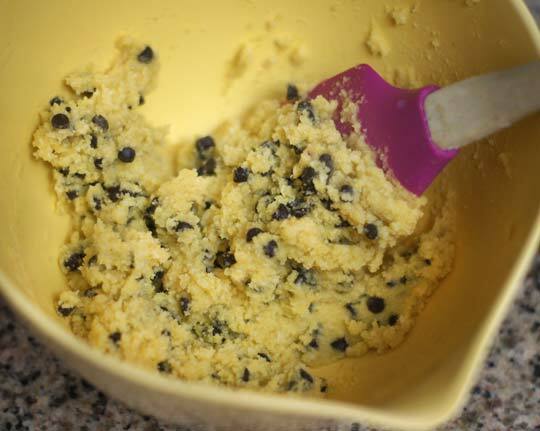 Use a heaping tablespoon to drop the cookie dough onto the lined baking sheet, and use your hands to flatten the cookies. Keep in mind these cookies will NOT spread on their own, so you'll want to shape them how you'd like them to turn out. As I mentioned above, there is no substitute for coconut flour. 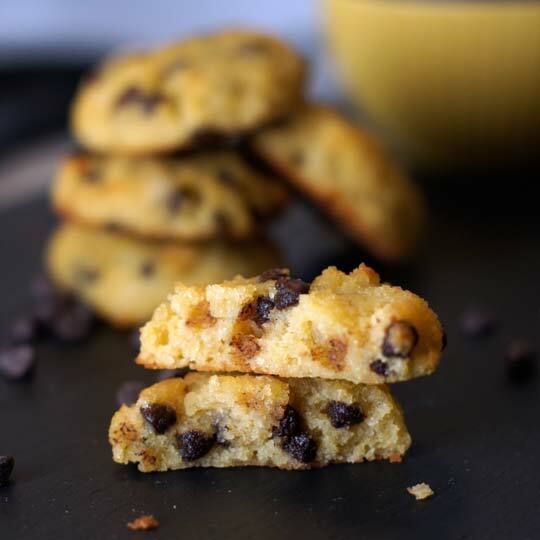 If you want to use a different type of flour, I’d recommend trying my chocolate chip cookie recipes using almond flour or buckwheat flour, instead. I don’t recommend trying to use flax eggs as a substitute for the whole eggs in this recipe. I tried it myself, and the resulting cookies were mushy and wouldn’t come off the pan. Feel free to use honey, instead of maple syrup, if you like, keeping in mind that honey is sweeter, so you’ll need to use less of it. Reader Feedback: What’s your favorite recipe using coconut flour? I find that it seems to work better in softer baked goods, like muffins and cakes, so I think these Strawberry Cupcakes are my favorite so far. My dough is super running. Letting it sit and it doesn’t seem to be helping. There will be no i can shaped these cookies. Can adding almond flour to the the recipe help? I love this recipe. I leave out the vanilla and salt and use a generous portion of local raw organic honey (and no maple syrup) and a bit more oil that is called for. Very good, thank you! I tried to make a double batch vegan the other day, with three flax “eggs” total. The batter seemed too runny so I added significantly more flour and then after a test batch of three cookies, I added more oil. They turned out nicely. I shared them with many people. A couple who had tried the others said they liked the vegan ones better. So it’s possible, just requires a little more time to get the balance right with a few tiny batches to see how it’s all coming along. Would you mind giving us the vegan recipe for these? About how many flax eggs? And what about baking time? Thank u! I made the cookies but forgot to soak the dried mango. They still turned out really nice! My next experimentation idea is with mango. I’m going to sub/add freeze dried mango, crushed, with the coconut flour, and rehydrate some dried mango pieces with hot tea, and add them to the recipe and try to make mango cookies. Wish me luck! These are super simple and absolutely wonderful ! I used Agave Nectar in place of maple syrup , perfect sweetness at 1/4 cup . Thank you so much for the recipe ! Love these, I used 50% less sugar Maple Syrup but still came out amazing. where do you get the maple syrup? Just made these and they are still pretty warm as they’ve only been out of the oven a few moments, and I seriously love these. They are so moist and perfect. Will definitely be making them again. As for the chocolate chips, as I didn’t have any on hand, I ended up omitting them. Instead, I sprinkled a bit of cinnamon on top of each cookie once they came out of the oven, so they are more like snickerdoodles. I also used honey rather than maple syrup, in the same quantity. Great recipe! Thanks. Made these tonight and they turned out incredible! My fiance and I ate them ALL!! new favorite go to cookie recipe! Hi there- I love your site! I linked to your recipe in a post I did for vegan chocolate chip cookie dough. I can’t wait to see more of your lovely blog! These look great, but I am unable to have honey of maple syrup. Would is be possible to make with powdered Stevia? Also, I think storing them in the fridge makes them a little doughier, and they taste good cold. oh wow, these cookies are amazing! I love the texture and how simple they are to make. If you are using Bob’s Red Mill Organic Coconut Flour, I would recommend sifting the flour first, I think it makes the texture of the cookie better. Made these with raw agave instead of maple syrup…still yummy! We made these cookies this weekend! They are incredible! Thank you so much for the great recipe! Wonderful cookies! I have made countless coconut flour cookie recipes adding and working the recipe. All I did with this one is add a little extra coconut oil and MAGNIFICO! AND they didn’t taste super eggish like many recipes do! Nummy. To eliminate the syrup or honeycould I use the equivalent amount of coconut milk mixed with liquid stevia to the acheive the same sweetness? I made these cookies this morning and due to my sensitivity to eggs, I used Paneriso egg substitute and they baked just fine and taste AMAZING! Also instead of using chocolate chips (of which I didn’t have), I used 2tbsp of pure cocoa. These cookies tasted like the Enjoy Life brand double chocolate cookies. I forget so easily how absorbent coconut flour is. I was seriously skeptical about my puny 1/3 cup, but boy, does it just expand like nobody’s business. These were great. Even my husband, who dislikes coconut, said they taste pretty good. Thanks for your tenacity with healthful cooking; sweet tooth people like me need a little curbing every once in a while! Hi Sunny/Megan- I need to make a paleo nut free vegan dessert (that is also low in oxlate) for my birthday. I haven’t had much luck finding a cake, unfortunately, so I figured these cookies would be good to try to create a cake like dessert. Except I need it to be vegan. Do Ener-G egg replacer go 1:1 ratio with the eggs that are used in this recipe? Are any other changes needed? Thank you- very much appreciate help! I have never made anything with coconut flour that I was too impressed with…but THESE. ARE. GREAT. I am even one of those people that like rock hard/crispy cookies so that is yet another reason that I am so surprised that I love these. They are my current favorite!! I wish I could stop eating them. Simple, easy, soft and delicious. Even the kid liked them. I only had extra large eggs but I added a tiny bit more coconut flour and they came out fine. Thanks! Decided to give these a go tonight with a few tweaks. Baked for 15 minutes and they came out great :)! Still cake like but with a little chew to them. Hope that helps anyone trying to make them vegan as well (minus the honey obviously). I found these a little dry, good but a little dry. Would adding more maple syrup help? Adding any extra moisture may help, but you might want to try storing the cookies in a plastic bag overnight– I found that they become MUCH more moist the next day! They did taste delicious! Thank you. I am curious – I just made these and I am waiting for them to come out of the oven but they are very runny. I couldn’t have shaped them if I tried. Did I miss something in the measurements or something? I am quite certain they will work to satisfy my craving but I would like to fix the problem if anyone has suggestions! You might want to let your batter sit for 5-10 minutes next time, to see if it will thicken up. Mine thickened while I was stirring it, but different brands of coconut flour could yield different results. Hope they still taste good, regardless! I made these last night and although my dough was solid enough to shape before sticking them in the oven, they didn’t hold its shape. They just about doubled in size while baking but they weren’t totally flat either. They turned out great either way! Yum! I bookmarked these & hope to make them, soon! Thanks for this recipe & for reposting the strawberry cupcakes – I immediately bookmarked them, too. I still haven’t gotten coconut flour, yet. But when I do I’m planning to make those 2 plus the donut recipes you’ve posted :0)! Those look delish…new reader and can’t wait to scour your blog for more recipes! Cheers! I live in high altitude have found adding a little coconut milk helps with the dryness. Also helps if you have to use stevia instead of maple syrup. Cacao nibs are good in these also! Everyone has been making cookies! I’m going to have to just make all of them. Love that they are super simple! Made these tonight, and they were a bit dry (as coconut flour treats tend to be! ), but still really tasty. If anything, the bit of dryness helps you stop at just one! Thanks for the recipe. These cookies are delicious! Toddler-approved 1 and 2 year olds). I made these today and they were great! I also come from metric system but for baking much prefer cups and teaspoons – so much easier and quicker to measure. Treat yourself to a set and soon you’ll be asking the grams peeps to give their measurements in cups. What kind of chocolate chips do you use? Do they have sugar in them? Obsessed! I’ve been on a total coconut flour kick lately. I’m almost finished with my batch of coconut flour lemon poppyseed muffins…so these are next! Can I get your coconut flour lemon poppy seed recipe? Thank you in advance! Do you see apple cider vinegar anywhere in the ingredients??! Thanks! I have all the ingredients. Can’t wait to make them! I’m wondering about making mini muffins with this recipe, since you mentioned they are similar to muffin tops. Either way, they look delicious! Thanks for a fun coconut recipe. Yay, you posted them! Thank you! I have a question. I store my coconut flour in the fridge, and it clumps a lot. Do you sift it before using it in your recipes? If so, do you measure before or after sifting? I think that our favorite coconut flour recipes so far are the chocolate and blueberry muffins from Elana’s Pantry. This is my go-to recipe for chocolate cookies,sometimes I’ll add raisins, making them this morning for my orhto dr.
Why doesn’t anyone just use coconut sugar? It’s a way better choice than maple or honey which are high carb. Coconut sugar is organic, only 4 carbs and have vitamins and minerals and tastes like maple sugar or brown sugar! A natural sugar that’s good for you! In this particular recipe a liquid sweetener works best, though, because coconut flour requires SO much liquid to work correctly.